YOU ARE GREAT – WHY? Every day this web site and blog page receives hundreds of messages and comments. About 10% are ridiculous spam that are automatically deleted. Roughly 15% contain admiring gestures and then ask for advice on how to write similar blog posts. These are deleted because it would simply take too long to reply to each one. Furthermore; Neuro-faultProtection may be all about high performance thinking but we are not here to teach how to write good articles. The compliment is greatly appreciated. The only comment of any worth is to say if you like this style then study its structure and copy it. The remaining 75% are simply wonderful comments reflecting your appreciation of these blogs. We would like to reply to each one but that would take just too much time and detract from our work of training and coaching those who are sufficiently serious to take action in mastering their lives to get the very best out of themselves. The internet is wonderful in many ways though it does have problems. One of the problems is people will skim through trawling for bits and pieces of information. In many senses that may be informative. The downside is that one can build up a distorted understanding of a particular subject, especially one as complex as getting to grips with high performance strategies. The next step is to take Neuro-fault Protection training and coaching in order to get all the important pieces in the right place and order so that it really does work for you. Thank you for your wonderful comments and support for the work we do for excellence. Our greatest joy is to see you rise above mediocrity and excel. 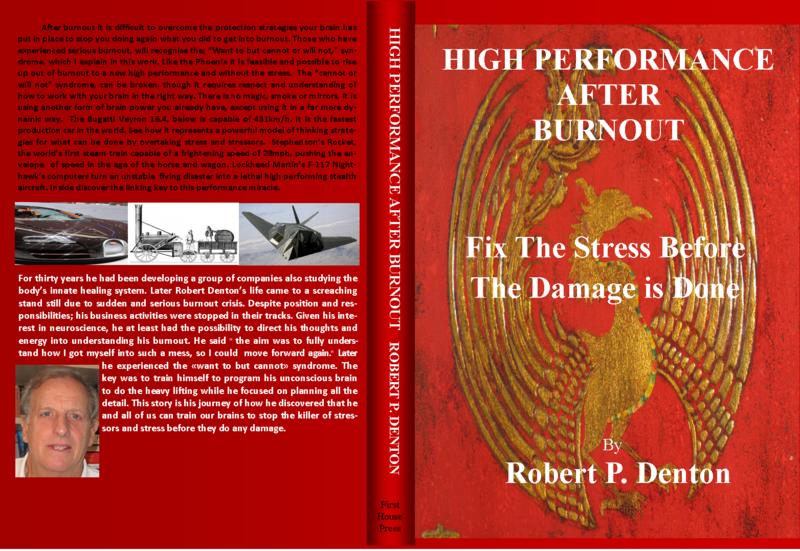 It is all in Robert P. Denton’s new book ‘High Performance after Burnout’ ISBN 9781512294705 is available at www.amazon.com or order from your local book store. This book explains how your thinking processes work. Why stresses and stressors dominate your life and mostly you are not aware of the fact or extent. Most importantly it also explains how you can change your thinking processes to take back control of happiness and abundance and put stress and stressors where they belong. For definitions and more information please see: Specific pages listed above just under the image of a mountain river tumbling through rocks. ← WHY DO YOU DO IT?